Sometimes the stories behind the quilt blocks are just as interesting as the blocks themselves. When I first saw the name of the block I figured it was one of those regional names and if I did a little googling I would find it by a name that was familiar to me. The search did not reveal any other name for the Fifty-Four Forty or Fight quilt block. It did reveal a very interesting history behind the name though. I am doing a block of the month in my Facebook group that is all star looking blocks. When I was designing the quilt and looking at historical star quilt blocks I thought it looked really pretty and with today's tools pretty straightforward. 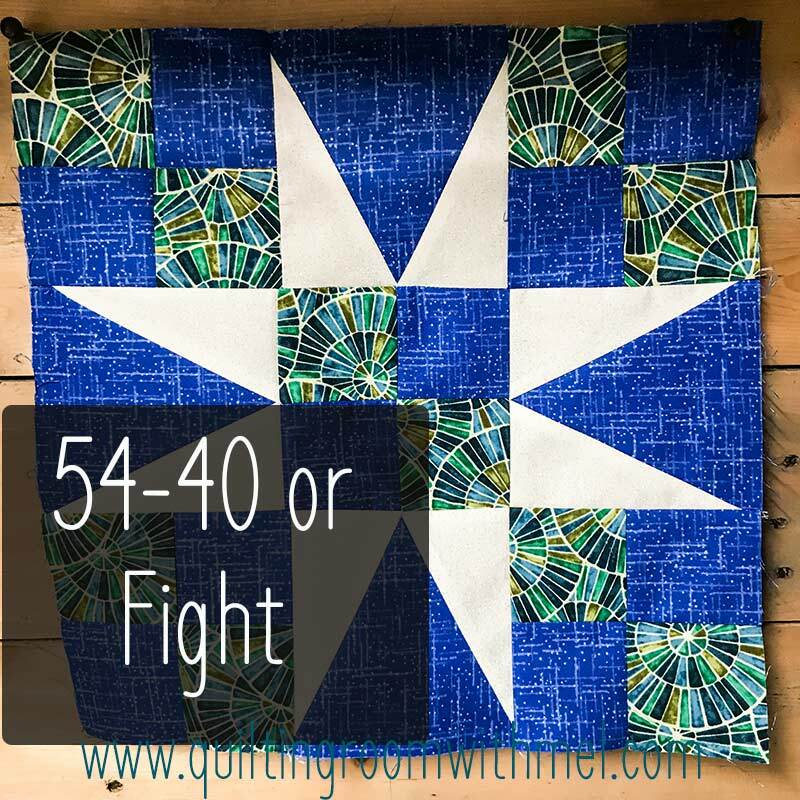 I had never heard of the Fifty-Four Forty or Fight quilt block before. That's not really unusual, quilt blocks seem to vary in name across regions but usually, a quick search will reveal to me a name I have heard and my brain will register the pattern. I didn't find another name for this block instead I found an interesting history that I felt needed to be shared. People have used art to express political beliefs forever. Women often stitched their political views because they weren't supposed to voice them really. That's where this block comes from. In 1844, America didn't look like it does today, some borders were disputed. James Polk was an unknown from Tennessee who had been nominated for the Democrat canidate for President. In order to gain national attention in hopes of becoming President. Polk realized that manifest destiny was what could get him elected. He said he would expand the country to including Texas, California, and all of Oregon. The Oregon border latitude was 54 degrees, 40 minutes. He used the slogan "Fifty-Four Forty or Fight" as a rallying cry. If you didn't know, James Polk became president but he didn't win the 54th parallel. He compromised with the UK in 1846 at the 49th parallel. North of that became Canada. The quilt block didn't show up until 1933 though, 89 years after Polk made the slogan popular. Now it's possible that the block had been being made for 89 years. In the 30s big newspapers started publishing quilt block patterns, similar to what I do now. Nancy Cabot released this one in 1933 in the Chicago Tribune she said in her article that "women had no outlet for political expression and the block was the expression of patriotic American women." I am sure other newspapers ran it as well but I couldn't find it in my grandma's patterns from the Kansas City Star but that doesn't mean they didn't publish it either. You do need a Tri-Recs template. I am linking to the one I have. If you haven't used it before I do have a tutorial on the Tri-Recs ruler set. Blue Fabric QT Fabrics Matrix Slub Texture Lappis - 4 triangles from Tri-Recs ruler 5 1/4" strip, 1 strip 2 7/8" x 29"
Graphic Fabric Ink & Arrow Fabrics Zola Mosaic - 1 strip 2 7/8" x 29"
For written instructions please join the Facebook group. You may have to trim the four patches, depending on your seam allowance. They need to be 5 1/4". For more quilt block ideas and more be sure to sign up for our newsletter below. As a thank you gift you'll get a printable sewing themed to do list for your personal use.